LIONS AND TIGERS AND.... LEOPARD? Go bold or go home!!! When we were taking this photo my Mom was worried about people looking at my bum. hehe these babies are tight... great for those of us who have no bootay!! I've read people's Facebook statuses before that said that girls should never wear leggings as pants.. sooooooo... what do you think? Me personally, I think its cool. As long as its done right. If they are see through or anything like that I say no. I usually never wear them as pants, but I was going for the rocker-chic look so i just did. I loved how the outfit turned out. That is all that matters right?!! AND remember... spread the word about my blog and follow if you haven't yet. I will start doing give-a-ways as soon as I get 50 followers!! 2 comments on "LIONS AND TIGERS AND.... LEOPARD?" I am absolutely IN LOVE with this look girl. I just bought these leggings & noticed how extremely tight they are so I was worried how or where to wear them, this blog definitely helped & gave me great ideas...now I just have to gain the kahonaaee's to wear em!! I also love love love your top. You definitely know how to layer & look great, jealousss. Great post boo! LOVE this outfit!!! 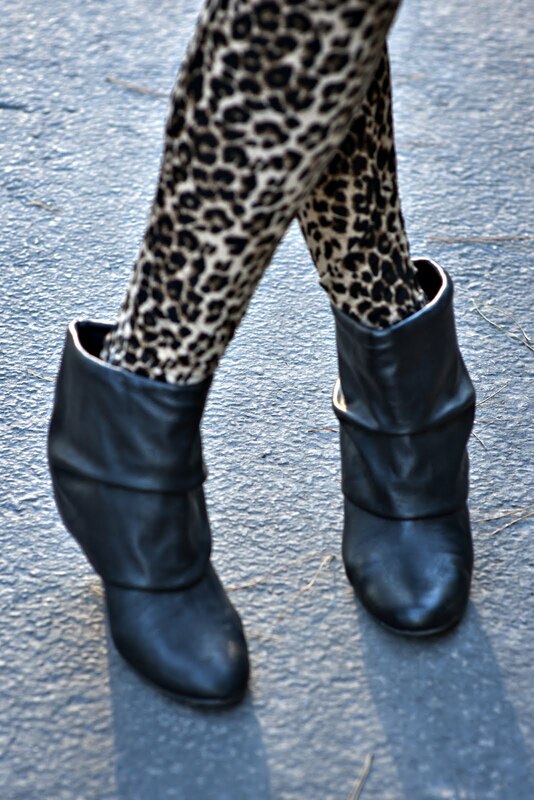 if I had leopard leggings, you bet i'd rock them as pants!! maybe i'll hit up styles :) i want a lace shirt super bad but haven't found the right (cheap) one yet... you look fab jay!! !